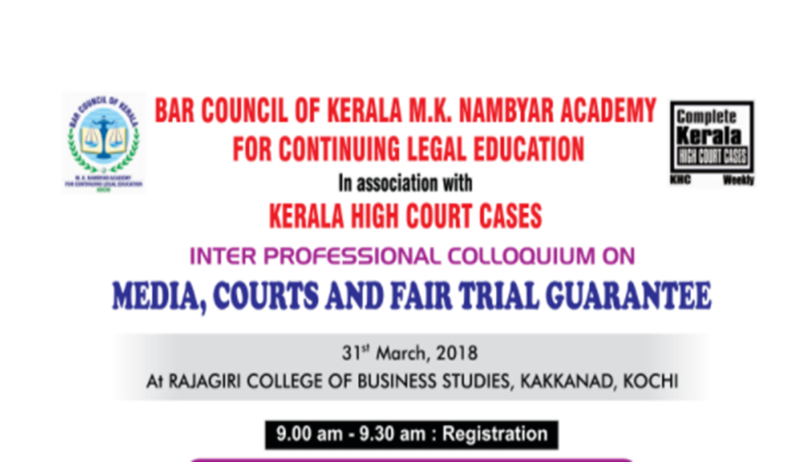 Bar Council of Kerala MK Nambyar Academy for Continuing Legal Education, in association with, Kerala High Court Cases, is organising an inter-professional colloquium on ‘Media, Courts and Fair Trial Guarantee’. Prof. NR Madhava Menon will deliver the welcome address, followed by Justice R Basant’s presidential address. After the keynote address by Shashi Kumar, Justice Dama Sheshadri Naidu will deliver the inaugural address. The first technical session will be based on the theme ‘Constitutional and Statutory Framework Governing Media Freedom in Relation to Court Proceedings’. The second technical session will be based on the theme ‘Balancing Media Freedom with Fair Trial and the Independence of the Judiciary’. In the valedictory session, a Lifetime Achievement Award would be awarded by Kerala High Court Cases to Jagdishchandran Nair, advocate, Kerala High Court.